Charles Barkley wasn't exactly made to feel completely welcome at the opening game of the Western Conference Finals in San Antonio on Monday, when a group of women, apparently led by the girlfriend of the Spurs' Tim Duncan, wagged their collective fingers at him. The TNT analyst and former NBA player has made some pretty harsh jokes about the size of the women in San Antonio, calling them "fat" and saying they love "churros" and "ice cream." "There's some big ol' women down there," he said earlier this month. "That's a gold mine for Weight Watchers … Victoria is definitely a secret … they can't wear no Victoria's Secret down there." According to the Dallas Morning News, Vanessa Macias, Duncan's girlfriend, was the ringleader, wearing a shirt with the words "Barkley Don't Know" and wagging her finger. Still, Barkley was undeterred by the apparent lack of love from some in the crowd. 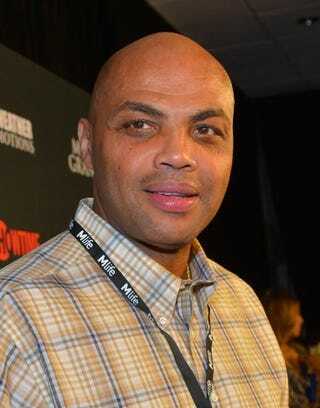 "That woman ain't from here," Barkley quipped. "They flew here in from Dallas. I guarantee you. Those girls are not from San Antonio. They flew them in from Houston and Dallas."